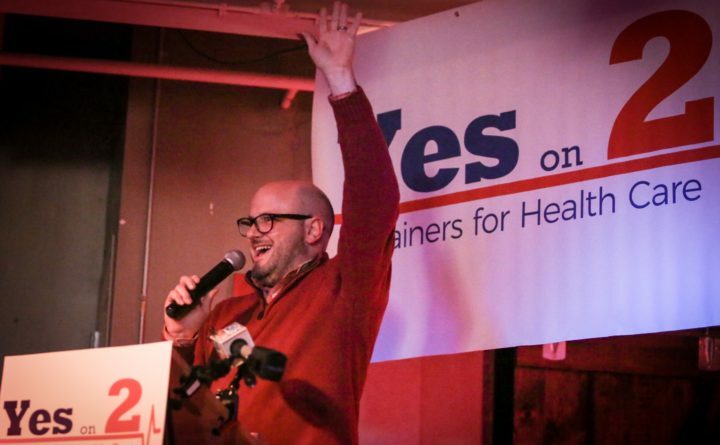 Jeremy Kennedy of Mainers for Healthcare rallys the crowd at the Yes on 2 headquarters in Portland on Tuesday night. Kennedy's group has campaigned for Medicaid expansion in Maine. AUGUSTA, Maine — Maine became the first state in the nation to pass Medicaid expansion at the ballot by a wide margin in Tuesday’s statewide election, but, hours later, Gov. Paul LePage and his fellow Republicans in the Legislature previewed a strategy to stall it. It’s becoming normal in Maine politics: While referendums have gone unimplemented or been changed by lawmakers throughout Maine’s history, they’re now used more often by well-funded groups to enact bolder changes, and some politicians have fought back swiftly against them. The four referendums that Maine voters approved in 2016 have been changed by the Legislature. A surtax on high earners was repealed outright. Two that sought to establish a ranked-choice voting system and a recreational marijuana market linger unimplemented. Tuesday’s Medicaid expansion vote was a rebuke to LePage, who has vetoed Medicaid expansion five times. But there are many ways to stall a law. The governor said in a Wednesday statement that he wouldn’t implement expansion unless the Legislature achieves hard-to-meet and disputed goals. Here’s how the fight to give health coverage to 70,000 Mainers could go. LePage says he won’t implement the law unless the Legislature funds expansion at his disputed cost estimate without tax hikes or funding raids. The law leaves implementation plan in the hands of the LePage administration. It also leaves funding a source up to the Legislature, but his Wednesday demand would be nearly impossible to meet. The Legislature’s fiscal office estimates that expansion will cost $54.5 million per year after accounting for $27 million of savings in existing health programs. The federal government would be expected to pay $500 million as its share. But the Maine Department of Health and Human Services has a higher estimate without mentioning savings. The left-leaning Center on Budget and Policy Priorities says the administration’s analysis is flawed and the Legislature’s estimate may be too high. LePage has been saying it’ll cost $100 million per year. That means it’s hard to know what level of funding the governor would even accept in any implementation plan. But such a plan is unlikely to materialize in the divided Legislature. Democrats will push for it, but Republicans are showing little interest. Former DHHS Commissioner Mary Mayhew, a Republican gubernatorial candidate, told WVOM on Wednesday that the initiative read like “motherhood and apple pie” and didn’t account for higher taxes that may be needed to pay for expansion. The law gives the LePage administration until May to submit an expansion plan. It could blow the deadline, but that could invite a lawsuit. Under the Maine Constitution, unfunded citizen-initiated laws take effect 45 days after the start of the next legislative session in January. But after that, the law gives the LePage administration another three months to submit an expansion plan to the federal government. Under that timeline, the plan would be due by May and Medicaid could be expanded by summer’s end. LePage spokespeople didn’t answer a follow-up question about whether Wednesday’s statement meant that they will refuse to draft a plan. That could invite a legal challenge, but the governor would counter by saying there’s no available funding. Democrats will fight for the law, but they can’t move it forward alone. It’s an issue that may run into next year’s campaign. LePage’s announcement blunted celebrations from expansion advocates and Democrats were indignant at Republicans’ statements. Senate Minority Leader Troy Jackson, D-Allagash, said in a statement that his party “will not give an inch in this fight,” which he called “a matter of life and death” for many Mainers. Legislative Democrats can keep Medicaid expansion on the law books, but if Republicans hold firm against funding it, expansion could be an issue to be settled in the 2018 election. Next year, LePage is term-limited with a wide-open race to replace him and the Legislature’s margins are razor-thin. Democrats hold a 74-69 edge in the House of Representatives and Republicans hold an 18-17 edge in the Senate. She noted that Republicans have argued in the past that voters passed referendums that they didn’t fully understand. But she said that such an argument may not fly with voters on health care in 2018.